"The Garrison also grants you other powerful benefits. It will play an integral role in your professions on Draenor, giving your character access to more than just the normal two primary professions (we’ll cover that in more depth in part 2 of this preview series)." So it seems that our long awaited in depth post about the interplay between Garrisons and Professions is on the horizon. Given how Blizzard has been tending to release information as of late, I'd imagine we'll see this next week around this same time. "Questing during the leveling process on Draenor will be the primary means by which you establish and grow your base, but the blueprints that allow you to construct different buildings can be obtained in a variety of ways. For example, you can find Followers who will teach you blueprints, obtain them via drops from creatures out in the world or in dungeons, or earn them via faction reputation." 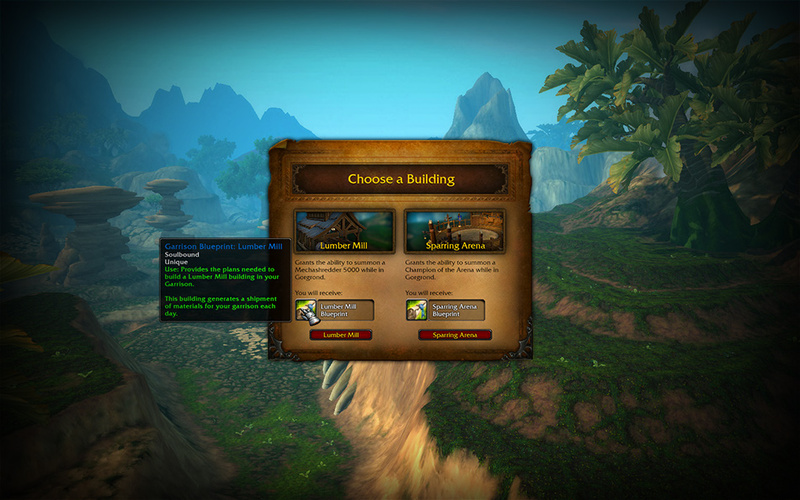 The example they give is Gorgrond where you'll have the choice between the Blueprints for the Sparring Arena and the Lumber Mill, with the Lumber Mill being the obvious choice of the two. From what I've dug up, Gorgrond (for example)is not a starting zone, but is adjacient to starting zones that are 90-92, so at the minimum it will possibly be is level 91-92 for starting to quest in this zone (someone feel free to correct me if I'm wrong). These choices will unlock zone-wide Klaxxi like buffs in the questing zones where you obtain them, but they should not make for much of a play difference, but to me it definitely points to the fact that we will need to complete every zone and possibly get to say 98-100 to fully unlock every Garrison Building that we'd want through questing or can, as they mentioned: "At level 100, you can also purchase blueprints from a vendor for the buildings from each zone you originally didn’t choose". It seems though that there will possibly be an optimal zone progression for gold makers as they level up. So they've mentioned some things about preening followers, comparing humanoid NPCs to gathering and collecting Battle Pets/Mounts, pointing out that different followers will be better suited for the different buildings in your garrison saying "You can maximize the productivity of your Garrison by assigning specific Followers to the posts where which they’re most proficient, such as Johnny Blacksmith, who will increase the output of materials from—you guessed it—your Blacksmith when assigned to work it." They also noted "Similarly, Followers more suited to combat would be ideal to send on missions, from which you can acquire an assortment of useful bounty," which will be interesting to see how that pans out. Of course you will have to level followers by sending them on missions to unlock their full potential, and they'll have to continue improving: "once they’ve reached level 100, they can continue to improve their item levels, abilities, and traits." All of these missions will be completed whether you're logged on or not, as these followers have a mind of their own! Honestly that's about all there is gold making wise in this Part 1 of the Garrison series, but be sure to read up on the article if you're interested in what Garrisons are bringing to the table in Warlords of Draenor outside of gold making, and how you'll be interacting with your Garrison.